Arapaoa (Arapawa) Island from above north end. East & Onauku Bays centre with Pickersgill Is. and Blumine Island (Oruawairua) behind in Queen Charlotte Sound left. 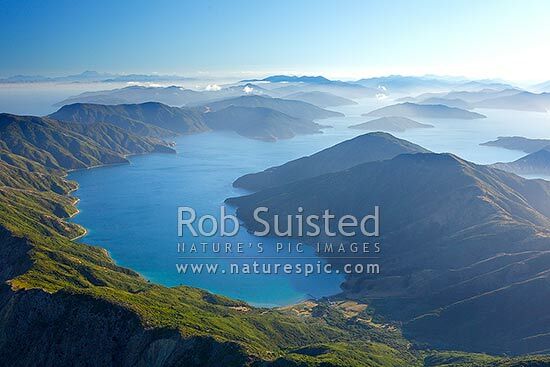 Cloudy Bay & Kaikoura Ranges far left, Marlborough Sounds, Marlborough District, Marlborough Region, New Zealand (NZ), stock photo.